Here’s some crucial information for anyone planning a trip to Dubai for DXB Airshow 2015. The planned dates of the Dubai Airshow 2015 are from the 04 – 12 November 2015 which includes practice days, rehearsal and the Airshow days. The Airshow itself will be held from 08 – 12 November 2015 inclusive. A full rehearsal will take place on 07 November 2015. Non-Airshow traffic intending to depart OMDW shall plan to be airborne at least 15 minutes before the closure of the airport. Therefore, clearance to start and taxi should be requested in line with this time restriction. Arriving flights with an ETA within 15 minutes before the time of closure may not be accepted. Except for those aircraft participating in the Airshow and for the purpose of practicing and validating displays, OMDW will be closed for landings and take-offs for all aircraft during the closure times (See table above). Arriving traffic to OMDW should expect to hold at BUBIN or DESDI and will be issued Expected Approach Times (EAT) by Emirates ACC. Traffic scheduled to depart during the Practice or Validation closures will have their startup delayed until reopening or immediately prior to reopening. IFR and / or VFR training flights will not be permitted in Dubai CTA during the practice, validation, rehearsal and airshow times. A Temporary Restricted Area will be established during the airport closure periods. The Restricted area will be within a circle of radius 5 NM, centered on the midpoint of the Display Box 245325N 0551106E. The area will extend from the surface to 10,000 FT AMSL. When active, entry will be subject to approval from the Airshow Flying Control Committee. Take-off and landing will be limited to aircraft participating in the Airshow. Commercial movements before and after the display flying will use the runway direction as declared on the ATIS and as advised by ATC. 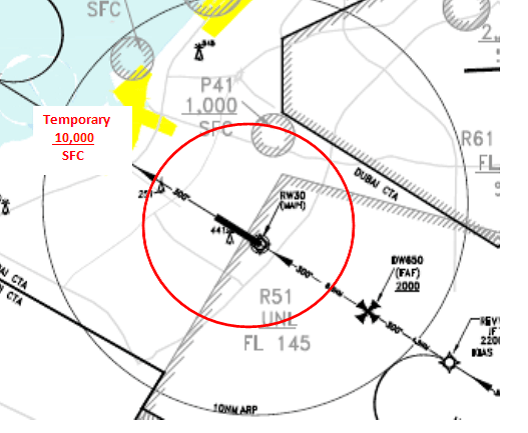 Aircraft will not be permitted to enter the 5 NM restricted area (Fig. 1). Vehicles and aircraft will not be permitted to enter the runway and the lateral limits of the Display Box. Helicopter operations will not be permitted during the period of display activity. Al Maktoum International Airport (OMDW) is designated as IATA Level 2 Airport. All exhibiting aircraft are therefore required to follow the scheduling procedures as mentioned below. Dubai Civil Aviation Authority (DCAA) – Landing and traffic rights permission. Airport Coordination Limited (ACL) – Coordinated Slot Authority. Operators shall not be allowed to operate to or from OMDW without obtaining confirmed slots from Airport Coordination Limited (ACL). Slot authority gives permission to operate at a specific date and a specific time and includes time on the ground. Slot times are on/off block times. Slot requests for exhibitor’s aircraft will be processed after 01 September 2015, on a first come first served basis. All slot requests should be agreed and finalized by 01 November 2015. Requests should be sent to ACL’s slot request email address as detailed below using the IATA SSIM chapter 6 format. If you are not accustomed to SSIM send a completed Slot Request Form to the email address below. Please be aware the manual processing times of the Slot Request Form may result in lower priority of slot allocation. All requests must include arrival and departure information. Arrivals: 0450 – 0905 and 0950 -1405. Departures: 0440-0845 and 0940 -1345. Operators are instructed that OMDW shall not be designated as an alternate during any period when the 5 NM temporary restricted area is active. Operators are advised to check AIP Supplements and NOTAM on the days prior and during the Airshow period. UAE overflight permits are not required / landing rights are required. Slot approval requested by an agent 24 hours in advance is preferable to attain desired slots. OMDB is currently operating at 97% capacity. The best opportunity for arrival and departure slots is between the hours of 1000Z – 1400Z daily. Overnight parking is possible but it quite difficult to obtain for medium and wide body aircraft non-scheduled operators. UAE overflight permits are not required / a landing rights are required. Parking is subject to availability, but approval is generally provided for all aircraft types. Every nationality will be checked on entry. Please note: The General Civil Aviation of the UAE (GCAA) have introduced a mandatory Advance Passenger Information (API) requirement for all passengers and crew arriving to, and going from, the UAE. A passport and a visa before arrival is required. Holders of normal passports and a copy of pre-arranged visa can obtain a visa on arrival, provided their passport is valid at least six months on arrival. Pre-arranged visas must be deposited by the sponsor to the Immigration Authority and can be issued for either 96 hours, 14 or 30 days. Deportation on the same flight will follow if the sponsor or a representative is not present at the time of passenger’s arrival at the airport. E-visas can be obtained via www.ednrd.ae – these visas are valid for entry at any international airport of the UAE. Airlines can check the validity of an e-visa at the same site by clicking on the “Query DNRD APP” button. All visitors must hold documents to prove their next destination and have a sponsor in the UAE to cover their stay. Note: Visitors not holding return/onward tickets could be refused entry. Holders of normal or emergency passports issued to EU citizens can obtain a visa on arrival for a maximum stay of 30 days, free of charge. All fresh foods such as fruit, vegetables, dairy products, fish, seafood, meat and food stuffs from Japan with validity period of less than two weeks. Foodstuffs, other than fresh foods, with validity exceeding two weeks is permitted, when accompanied by a Radiation Clearance Certificate issued by the Japanese Health Authorities. Fruits and vegetables from cholera infected areas, cultivated pearls. Uncooked, edible seafood, fruits and vegetables from cholera infected areas. Note: Import of live and dead birds (and derived products) is prohibited from all Asian countries, Egypt, Iraq, Lebanon, Jordan, Syria, Tunisia and other countries that may be affected by Avian Flu. For birds in transit, from all other countries, a transit permit is required. Proof of purchase is required for large amounts of cash, gold and jewelry. Baggage must be cleared at the first point of entry. If you are transiting within 24 hours and not going through customs. In this case, baggage can be stored before customs clearance for up to 24 hours if you wish to leave the transit area, provided the baggage is interlined to the final destination. Import of local or foreign currency is allowed, however if this sum exceeds AED 100,000 (or an equivalent amount) it must be declared on arrival. No restrictions apply for exportation. Dubai is well serviced by the Dubai Taxi Corporation. We recommend booking hotel accommodation in the Dubai Marina area to save on commute time.